My house is full of dust. It's not as bad as it might have been, but I continue to cough. I really ought to have worn a mask yesterday. Enough about that. Who wants to see my pathetic wee kitchen? You may recall that we began tearing this bad boy apart a couple of weeks ago. At that point, it was just the wainscot on the ceiling and a couple of cabinets that were relatively easy to rip out. 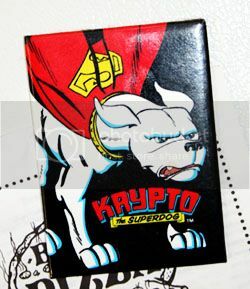 To be honest, it didn't make a difference in my daily life. Save for the empty space on one wall, this is my kitchen as it's been since we moved in. 1. My kitchen is horrid. I know. But it's funny what you can live with if you've no other options at hand. It's cluttered but clean, I promise you. Doesn't make it any less horrid. 2. My photos are all over the place. Apologies in advance for the mad dark shots. Storage has always been an issue. To that end, we used two rolling carts. 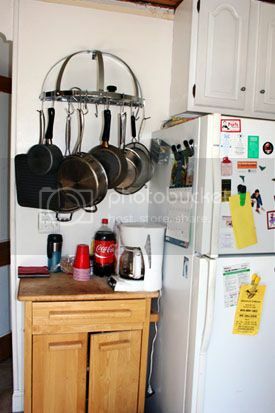 And a pot rack. Extra points to whoever spots the Tenth Doctor. Here's the other cart. There's a caddy of cleaning supplies and a recycling bin on the bottom. Still haven't figured out what I'm going to do about the recycling when we're all done. Allow me to assure you that my kitchen is not this tilty. I had to hitch myself halfway up onto the stove to get this shot. 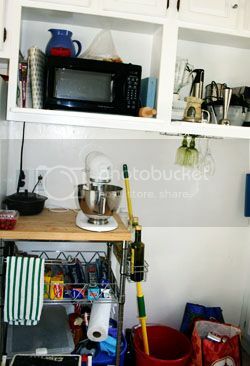 My kitchen is very narrow, but not uneven. Well, it's a little uneven, but it's no apartment in Dowisetrepla. Here's a closer view of the shelves. I'm going to miss them. Kind of. Corner. Crockpot. Chopping boards. Canisters. Corned Beef (in the crockpot). 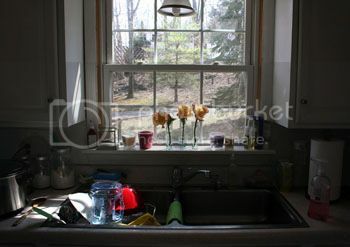 Ridiculously dark shot of the kitchen sink that I only included because I had no fallback. Clearly I wasn't fussed enough to put the dishes away before taking the picture. Note, overall, that I didn't tidy up in the slightest. Sorry, flist. I suppose I'm hoping you'll accept me as the flawed creature that I am. Other corner. Toaster oven. Method all purpose spray, version Pink Grapefruit. Hmm. Not quite as cool as the other corner. My main workspace. The banana is there to continue the Doctor Who theme. Bananas are good. And that's the sad little kitchen that was. Next... destruction! Also, kitties on boxes! I have that Doctor fridge magnet! He's currently holding up a valentine a friend gave me on my white board. 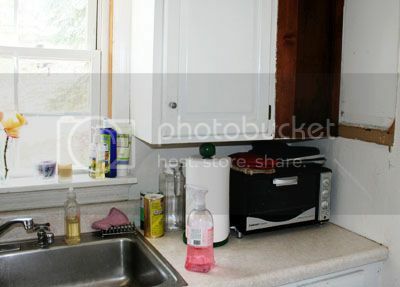 Man, and I thought out old kitchen had a lack of counter space. With as much as you like to cook, it must be really rough. Can't wait to see what you do with it. Cooking in this space has been very, VERY challenging. 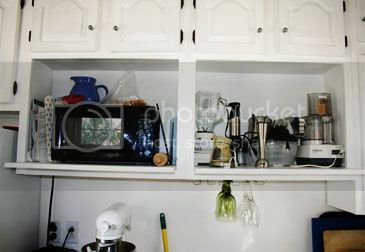 Nothing will change it being a very narrow, tiny space, but having more countertop is going to be a blessing. I think you apologize more than you need to! Clutter is not the same as unclean - and you only have so much to work with. Looking forward to the transformation... and I am jealous! 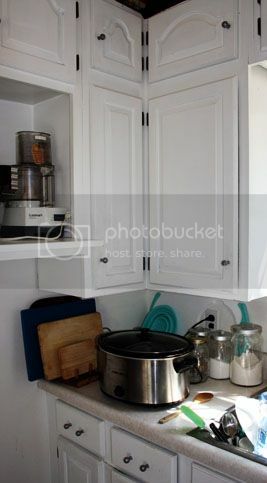 My kitchen has space, but it is not MY space (or even the husband's!). I would love the opportunity to rip it out and do it right! 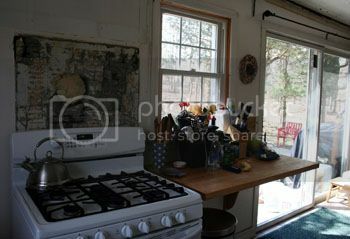 And yes, my kitchen is ever so wee, but when we're done it will be mine. One of these days I'll have a great, sprawling open space to work with. For now, I've got quirky cottage. It is what it is, and I'm darned lucky I'm getting the chance to do this. Here's hoping you get the chance to do the same! on a side note, I have no idea why that particular icon popped up. I intended another one entirely. Uh oh. I think my LJ's gone sentient. I can't wait to see the transformation! Keep us posted. I must say that I like your old cabinet doors better then our old ones. Our kitchen is really bad. I'll show you a photo some time. Just be glad I don't have a tactile function on my LJ. The thick, greasy coating over thick, ill applied paint is... *shudder*. This, despite my scrubbing and scouring. 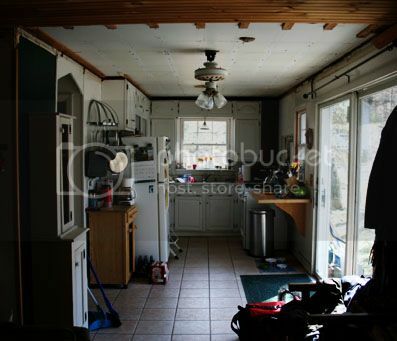 That's almost exactly how our kitchen was laid out before my mom redid it a few years back! 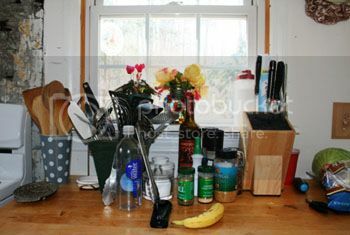 The lack of counter space must have been killer.